This fiber necklace is made from constructing a shape with nails (a warp) and a strong thread, then single weaving with a round nose needle over and under (the weft). I weave in different threads, wool, alpaca fiber, lots of other fibers and work in beads. This necklace features sterling silver native American charms that represent spirit guides. 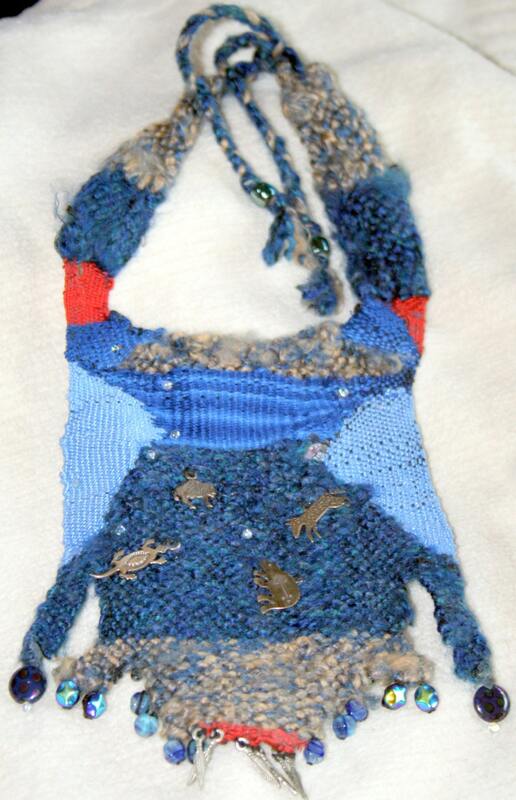 There is a buffalo, a wolf, a lizard and a bear on the body of this piece and a clear glass star. There are seven feathers along the bottom and multi colored Czech beads in shades of blue. The color blue symbolizes wisdom and confidence. Blue also represents the sky, rivers, lakes and water. The red symbolizes the desire to be aware and respect life. The necklace ties in the back and is 20 inches long. It has a bib-like appearance and looks very good on a turtle neck or sweater.